June 27, 2003, Mt Baker, Coleman-Park Traverse ??? The Park Headwall is the most aesthetic and direct ski line off the true summit of Mt Baker, dropping directly off the NE side of Grant Peak at a steep 50+ degrees for over 500 vft onto the Park Glacier below. David Coleman had been eyeing this route for years, and his obsession was further fueled when our friends Sky Sjue and Ben Kaufman skied it during a brief weather window in May, reaching the headwall via the Boulder-Park Cleaver (see trip report). But this late in the season, we thought it might be easiest to reach the headwall via a traverse from the Coleman-Deming route instead, since the Boulder Ridge trailhead is at a low 2700 ft and the ridge would be snowfree until at least 5000 ft. So Ben, David, and I planned to leave a second car at the Mt Baker Ski Area, and ski out to it via the Park Glacier and Ptarmigan Ridge. Highway 542 is still closed at 4200 ft, with discontinuous snow up to 3-4 ft deep around the parking lot. We left Seattle at 12:30 am, but a combination of delays plus the extra time needed to place the second car meant that we didn't leave the Heliotrope Ridge trailhead until 6:30 am. Oh well. We started off making good time, hiking on foot to the top of the moraine at 5800 ft and then skinning from there. Occasional marine clouds drifted in from the NW, but never thick enough to hide the summit. 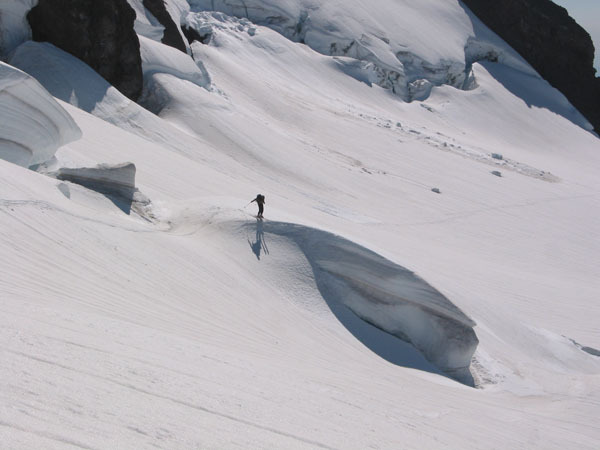 The crevasse hazard on the Coleman appeared to be minimal, so the rope and glacier gear stayed in the pack. Several inches of recent snow (last weekend's storm) on the glacier had consolidated to almost-corn. We reached the Coleman-Deming Saddle at 9000 ft by 11:30, and put the skis on the pack for the remainder of the ascent, as the snow was quite firm and frozen on the NW aspect leading to the edge of the Deming. The Roman Wall was in nice condition, firm enough for climbing with no post-holing. A lengthy lunch break followed by a slowing pace up the wall and across the summit plateau brought us to Grant Peak by 2:30 pm, in a steady 15-20 mph wind. Unfortunately, our arrival there brought disappointment as we looked over the edge at our intended route. The Park Headwall looked very firm and perhaps even frozen, and the Park Glacier below was riddled with large open crevasses, with a few more crevasses across the upper Rainbow Glacier leading to our exit via Ptarmigan Ridge. The glaciers were much more broken up than in May, and also much more so than in June of last year. It looked like we would have a sketchy descent on the headwall, followed by some tricky and time-consuming crevasse navigation. So the decision seemed clear: we would simply have to ski back down the Coleman-Deming and leave the Park for another day. We skied off the summit at 3:30 pm, re-traversed the summit plateau, and headed back down the Roman Wall on funky snow, sort of granular with a thin crust on top. The crust disappeared below 10000 ft, and the snow turned to a mix of decent corn and heavier glop. The ski route was still continuous (just barely) across the rocky ridge above Coleman-Deming Saddle. The ski down the Coleman was fun, with big GS turns down smooth sections of the glacier punctuated with an occasional jump off the edge of an inviting serac. We saw numerous climbing parties, but we were the only skiers that day. Below the glacier, we skied down the gully to the right of the moraine and reached about 5000 ft, just above where the Glacier Overlook Trail crosses the gully. The hike out was livened up by a tricky creek crossing in the high water of late afternoon. All in all, a great day with beautiful weather and 5800 vft of nice skiing, despite the disappointment of having to forgo the Park Headwall. This photo shows Ben Kaufman launching off the edge of a serac near 8000 ft on the Coleman Glacier.